Robert Indiana was born in New Castle, Indiana. He moved to New York City in 1954 and joined the Pop Art movement, using distinctive imagery drawing on commercial art approaches blended with existentialism that gradually moved toward what Indiana calls "sculptural poems." In 1962, Eleanor Ward's Stable Gallery hosted Robert Indiana's first New York solo exhibition. He has since enjoyed exhibitions at over 30 museums and galleries worldwide. Indiana's works are in the permanent collections of numerous museums, including the Museum of Modern Art, New York; the Whitney Museum of American Art, New York; the Metropolitan Museum of Art, New York; Stedelijk Museum, Schiedam, Netherlands; Carnegie Institute, Pittsburgh, Pennsylvania; Detroit Institute of Art, Michigan; Baltimore Museum of Art, Maryland; Brandeis Museum, Waltham, Massachusetts; Albright-Knox Gallery of Art, Buffalo, New York; San Francisco Museum of Modern Art, California; the Hirshhorn Museum, Washington D.C.; the Institute of Contemporary Art, University of Pennsylvania, Philadelphia; and the Los Angeles County Museum, California, among many, many others. 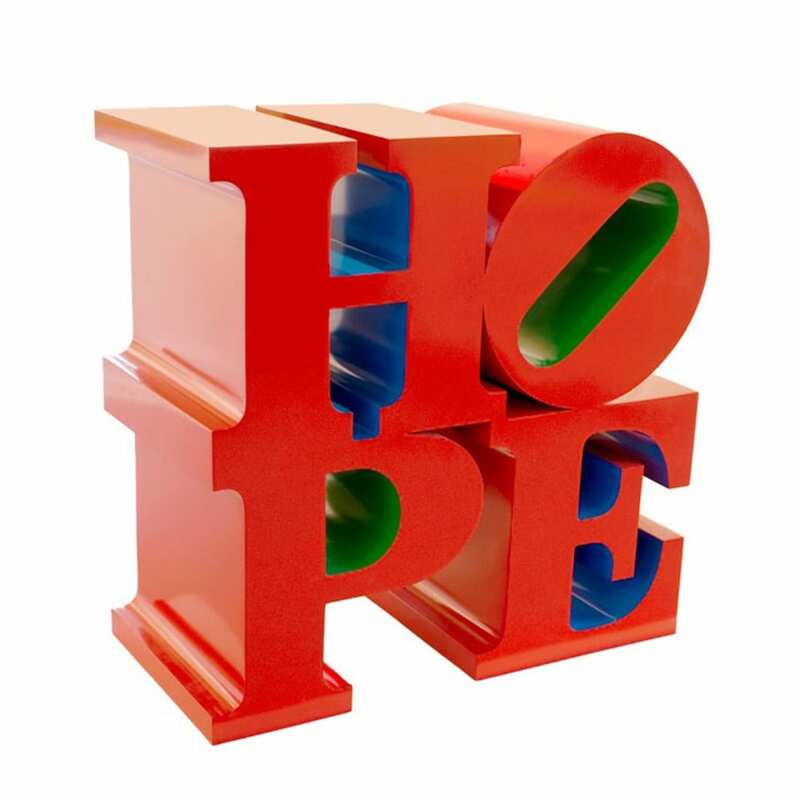 In 2008, Indiana created an image similar to his iconic LOVE (letters stacked two to a line, the letter "o" tilted on its side), but this time showcasing the word "HOPE" and donated all proceeds from the image to the Democratic National Committee for Barack Obama's presidential campaign. A stainless steel sculpture of HOPE was unveiled outside Denver's Pepsi Center during the 2008 Democratic National Convention and has since been installed in front of the John Hancock building in Chicago, Illinois.